Our third day in the Lakes, and our second full day. Today was planned to be somewhat easier going than the previous day, as we were waiting for Dennis and Linda to come over from Whitburn. We started off with a fairly leisurely breakfast. Well, three of us did. Kas started off with an early breakfast and a run, like she often does. We then went for another wander down to the side of the River Greta for a bit more stone skimming and general mucking about to fill the time. 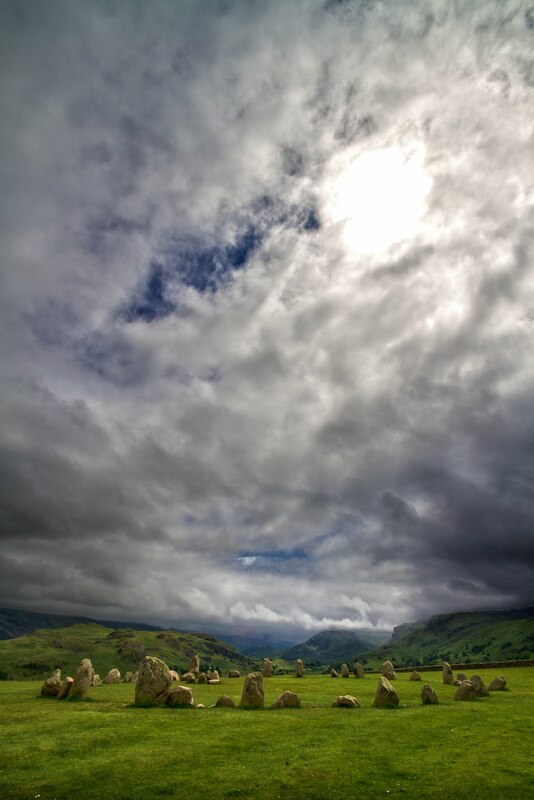 Once Kas was back I stole an hour or so to go and do a couple of caches up at Castlerigg Stone Circle. Thanks to Graham Richter for this wonderful photo from wikipedia. I wish I could manage one this good myself. When Dennis and Linda arrived it was already getting on towards late morning so we decided to head straight out for our daytime appointment. We’d decided to go catch a boat on Ullswater. There are a couple of services that run regularly during the day between Aira Force and Glenridding. We hadn’t booked, we just decided to play it by ear. The place we arrived forst was the car park at Aira Force, so we parked up and legged it down to the waterside just in time to catch a boat. It was kind of a grey morning compared to the previous days, so the photos aren’t great, but you get the picture. By the time we got to Glenridding it was definitely lunchtime. Glenridding was hit really badly by Storm Desmond in December 2015 and much of the village centre was flooded. Where we walked to first had evidently suffered very badly as it was right by the stream. The banks were still being rebuilt, in fact, which meant we were initially put off going in any of the cafes because of the building work going on outside. One looked OK through, and once we were inside it was fine, and the food was rather good. When lunch had finishes it was pretty much time to get back on the boat again so we would have the chance to do some walking at Aira Force too. Aira Force is a place I always seem to go to whenever I go the the Lake District. I think I’ve been there four times now, but each visit was sifficiently far apart that I don’t remember much of the detail from one to the next. The quirk of the trip this year was that people have got into the habit of hammering pennies into various bits of fallen wood by the pathside. I don’t remember that before. It was remarkably easy to do though, once you found an appropriate stone to use as a hammer. We walked a little way past the waterfall, and I grabbed a couple of caches on the way up, and eventually we reached the “plodging” bit above the waterfall, where we decided to stop for a while and let the girls get their feet wet. OK, I did too. Back at the bottom it was time for ice cream, while I shot over the road to grab another cache on the path down to the boat jetty. I’d not been able to grab it earlier because of the number of people around. Dennis and Linda drove back to the log cabin with us and we had a snack-based tea whilst chatting about nothing in particular, and then they shot off home. After they’d left, and everyone else had gone to bed, I attempted the very difficult job of wrapping up birthday presents without using any sellotape. I had paper, but not sellotape. D’oh! It sort of worked, but only because Ami’s presents neatly fit back into the cardboard box they’d been delivered in.